I love this Herbal Daily Cleanse Shampoo by Nature's Gate it is all naturel and makes my hair very clean. It calms down irritated scalp too. The smell is different from other brands but it is my favorite smell. Been using Herbal Daily Cleanse Shampoo by Nature's Gate for decades. Smell is intoxicating, need small amounts. Easy to rinse out too. Price can't be beat. Best shampoo EVER for me. Always compliments on how soft hair is and how great it smells!! Nature’s Gate‚ a trusted alternative for healthy hair. Your daily cleansing routine just got more responsible. Herbal Daily Cleanse Shampoo gently cleanses hair with a unique blend of Sage‚ Lavender‚and Rosemary. Ideal for normal hair. Ingredients: Water‚ Cocamidopropyl Hydroxysultaine‚ Sodium Cocoyl Isethionate‚ Disodium Cocoamphodiacetate‚ Lauryl Glucoside‚ Glycerin‚ Panthenol‚ Simmondsia Chinensis (Jojoba) Seed Oil‚ Borago Officinalis (Borage/bourrache) Seed Oil‚ Tocopherol‚ Ascorbic Acid‚ Achillea Millefolium (Yarrow/achillée millefeuille) Extract‚ Chamomilla Recutita (Matricaria/camomille) Flower Extract‚ Lavandula Angustifolia (Lavender/lavande) Flower Extract‚ Rosmarinus Officinalis (Rosemary/romarin) Leaf Extract‚ Salvia Officinalis (Sage/sauge) Leaf Extract‚ Urtica Dioica (Nettle/ortie) Extract‚ Prunus Serotina (Wild Cherry/cerisier noir) Bark Extract‚ Thymus Vulgaris (Thyme/thym) Leaf Extract‚ Ascorbyl Palmitate‚ Guar Hydroxypropyltrimonium Chloride‚ Leuconostoc/Radish Root Ferment Filtrate‚ Polysorbate 20‚ Hydroxypropyl Methylcellulose‚ Sodium Hydroxide‚ Glyceryl Undecylenate‚ Phenoxyethanol‚ Citric Acid‚ Fragrance*. Vegan / Vegetarian / Soy-Free / Gluten-Free / Cruelty-Free. Massage a generous amount of shampoo gently into wet hair and scalp. Work into rich lather. Rinse thoroughly. For best results‚ follow with Nature’s Gate Herbal Daily Cleanse Conditioner. May be used daily. None is perfect for me, why been using for decades!! 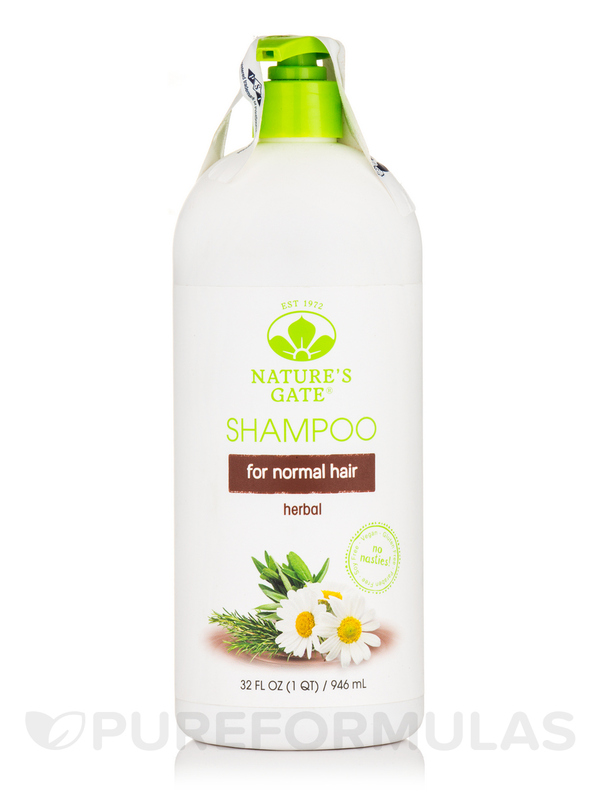 I love this Herbal Daily Cleanse Shampoo by Nature's Gate. It lasts so long because it's 32oz. It smells wonderful too. I purchased the conditioner but in a different scent because they didn't have the 32oz in this scent. My dad uses it too. Great product to wash your hair, if you don't want all the harsh chemicals like in many brands in the store. I would definitely re-order more for the future. Cruelty-free and vegan shampoo that works. My hair feels smooth after using Daily Herbal Shampoo by Nature's Gate. Also, it doesn't make my ears itchy.(awkward). I am using a Hong Kong herbal shampoo, but it's not SLS-free, so I am switching to this product now. Patti, yes this shampoo is paraben and sulfate free :) Jason products are as well. As for which is more natural, it would depend on what shampoo or conditioner you are comparing as they all are different in some way.